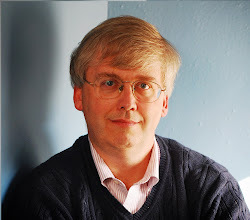 Erik Brynjolfsson and Tom M. Mitchell serves as co-chairs of a "Committee on Information Technology, Automation, and the U.S. Workforce," which produced the report "Information Technology and the U.S. Workforce: Where Are We and Where Do We Go from Here?" (March 2017). The report offers a nice overview of the extremely widespread adoption and application of information technology across the economy (which I'll skip over here) as well as discussion of the effects of information technology on productivity, employment, and inequality. Here, I'll just pass along a few comments on these themes. The emphasis of the report is on summarizing the various views and providing links to research, rather than on trying to draw hard bottom lines. "[E]conomic and societal changes occasioned by technological developments are shaped, not just by the availability of new technologies and their features, but also by ideologies, power structures, and human aspirations and agendas. Technologies are not exogenous forces that roll over societies like tsunamis with predetermined results. Rather, our skills, organizations, institutions, and values shape how we develop technologies and how we deploy them once created, along with their final impact." "A related, but more fundamental, issue is that productivity is neither a measure of technological progress nor welfare. Productivity is based on gross domestic product (GDP), which is in turn a measure of production or output. However, technological progress can increase welfare without increasing output. For instance, if Wikipedia replaces a paper encyclopedia or a free GPS mapping app replaces a stand-alone GPS device, then consumers can be better off even if output is stagnant or declining." 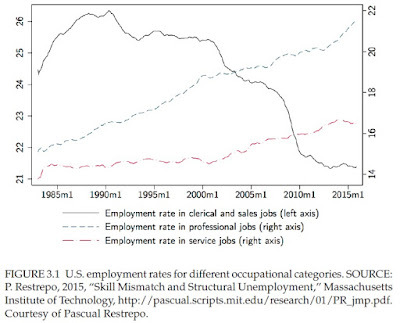 "There have also been substantial shifts in employment in various occupational categories. 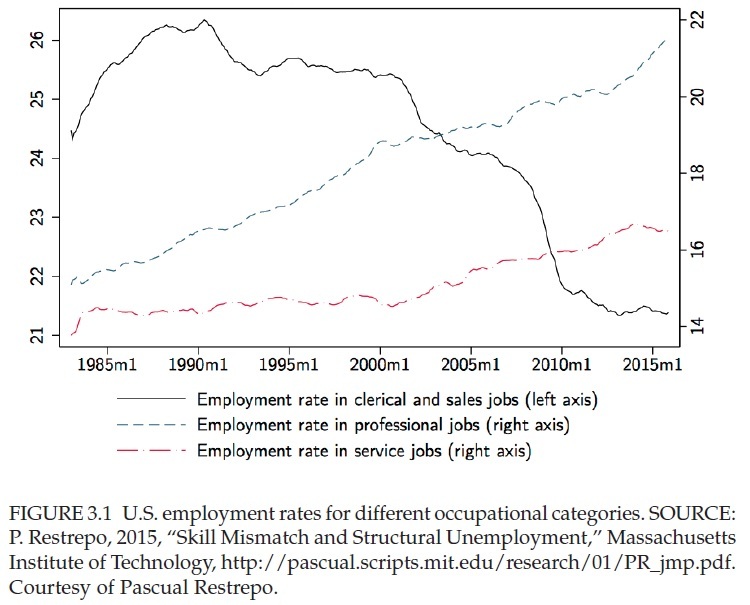 For instance, the employment rate in clerical and sales jobs has fallen sharply, while employment in professional jobs has grown, as shown in Figure 3.1." as new technologies automated tasks they had previously performed. Similarly, the replacement of horses by automobiles eliminated the need for blacksmiths. But as these jobs disappeared, new ones sprang up to operate, manage, and service the new technologies. For instance, in the late 1800s, the replacement of the stagecoach by the railroad went hand in hand with the creation of new work for managers, engineers, machinists, repairmen, and conductors. Simultaneously, there was a boom in a range of new service occupations, from teaching to entertainment to sales. Nonetheless, simultaneous automation of a broader range of tasks could create unemployment or perhaps reduce aggregate levels of employment for an extended period of time." "It bears repeating that this discussion of technology and inequality should not be read to imply that all aspects of inequality and its recent increase in much of the Western world can simply be attributed to technological change: one must also consider the role played by the demise of unions, concessions on wages and job structures, the offshoring of work to places with lower wage rates, tax policy, and the increasing contribution played by financial investments in the accumulation of wealth. Indeed, increasing inequality in the United States has a political dimension, a phenomenon that is, of course, not new." "IT is enabling new work relationships, including a new form of on-demand employment. Although current digital platforms for on-demand work directly involve less than 1 percent of the workforce, they display significant growth potential. Many employers are increasingly viewing their relationship with employees as a short-term commitment rather than a lifelong investment. As Manpower Group CEO Jonas Prising recently put it, `Employers have gone from being builders of talent to consumers of work.'" Later School Starts for High School?